We’re thinking these pumpkin ‘hand pies’ would be fun at the table during the holidays! Preheat oven to 375F. Line a baking sheet with parchment paper or a silicon baking mat. Combine the cinnamon roll mix with the oil, 2 eggs and water in a mixing bowl. Mixture may be crumbly, that’s fine. Turn the mixture out onto a clean work surface and knead a minute or two until the dough is smooth. Divide into 12 even sized balls. Combine the pumpkin with the brown sugar, cinnamon, nutmeg, salt, cloves and cream and whisk until smooth. Roll each ball of dough between 2 pieces of waxed or parchment paper into a 4 inch circle. 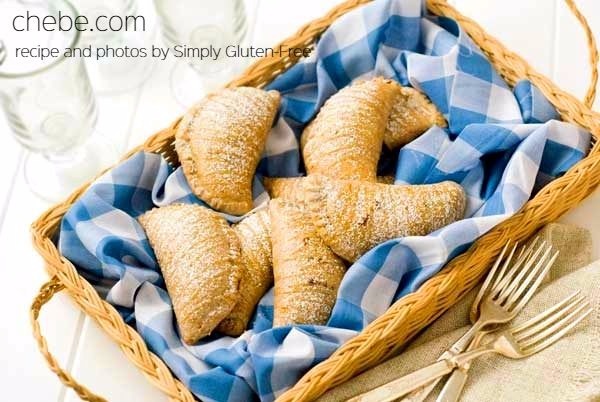 Place a heaping tablespoon of pumpkin filling on the dough, fold the dough over, forming a half circle and fold the edges of the dough over and press together. With the tines of a fork, seal the edges. Poke the top of the empanada a few times with the fork and place on the prepared baking sheet. Repeat with remaining dough and filling. Whisk the remaining egg with a splash of water. Brush the top of each empanada with the egg mixture. Allow to dry for a minute and then brush again with more egg mixture. Bake for 20 – 25 minutes or until the crust is browned and firm. 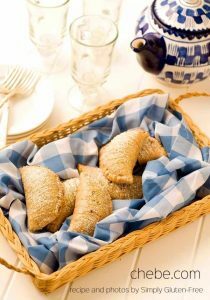 Place a wire cooling rack on top of a piece of waxed or parchment paper, place the empanadas on the rack and let cool. Mix the powdered sugar with the maple syrup until smooth (you may need to add a drop or two more of maple syrup). Drizzle on top of the empanadas. Dust with more powdered sugar if desired.